Please Note: This item will ship In June 2019. Subject to change. 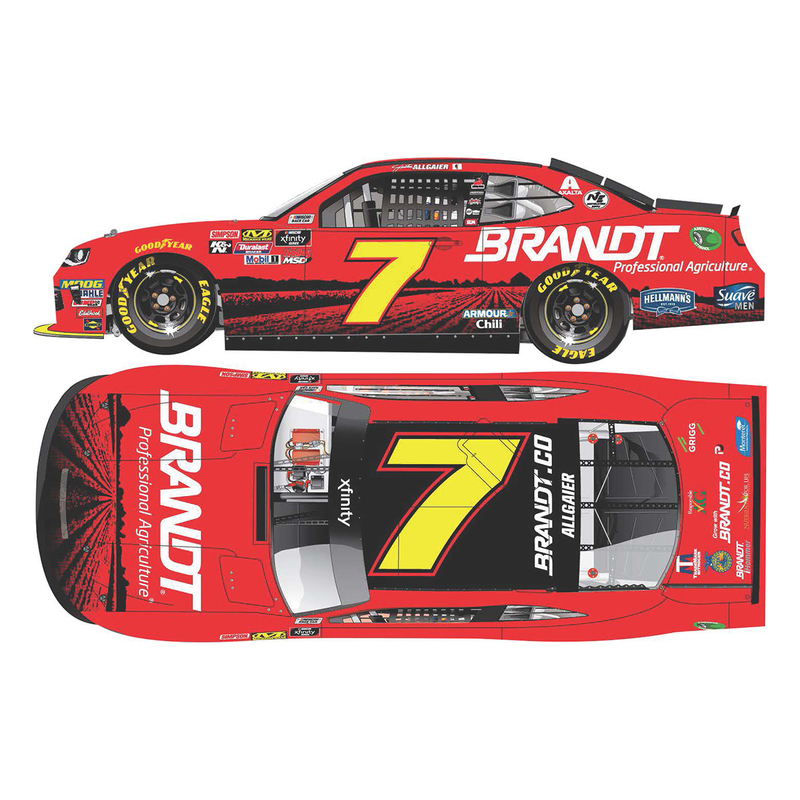 BRANDT Professional Agriculture, a longtime sponsor of JR Motorsports driver Justin Allgaier, is bringing back a fan-favorite scheme on the No. 7 BRANDT Chevrolet Camaro when the NASCAR Xfinity Series™ takes the green flag in the 2019. First seen on the track in the 2018 NXS race at Chicagoland Speedway, Allgaier’s 2019 ride features silhouetted fields from the BRANDT’s own research farm on the hood and sides, along with black and yellow accents. Now the official die-cast of Allgaier’s 2019 BRANDT Chevrolet is available to order from Lionel Racing. Each 1:24-scale die-cast features an opening hood, rolling Goodyear tires, authentic graphics package, and more. The car is also available in 1:64 scale. What’s more, the 1:24-scale die-cast can be purchased in either an autographed or a non-signed version. Quantities will be limited, so order now! Each ARC Collectable 1:24-scale hood open collectible die-cast includes manufacturer-specific engine detail, die-cast body, plastic chassis and detailed interior. Each collectible die-cast also features a DIN (Diecast Identification Number) for registration.